The new group is open! Click here to go and join! towns and attack cities. For every creation you post you can earn points that will advance your rank. Come join the biggest fantasy role-playing game on MOCpages! 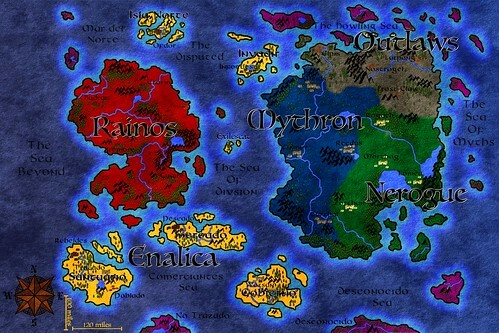 Order was made out of chaos - that is how the faction of Nerogue was founded when it rose from the sacking of Tomeu, and that is what (along with justice) the members of the order devote themselves to. Many Nerogueians are reformed outlaws, but they devote themselves all with a single-mind to the task of restoring peace and order to the world. This army's uniforms are dark green, and its formal colors are dark green, dark red, and black. The Outlaws are wanderers, criminals and adventurers. Their home is Bodus, the frozen deserts and mountains of the north. They came, pursued by the law, cast out of their homes, and exiled from the cities of the south and the west, to found their own cities where anyone can find a place free from persecution. In time, they built a confederacy of independent city-states. Now, they head out from the safe lands of the Confederacy to seek money, freedom, adventure and fame. No colors are assigned to the outlaws. Quest Challenges - 3 Points. 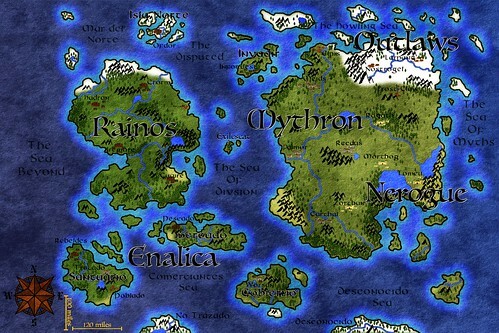 The Lands of Mythron, on hold? ?